The other day on my Facebook page I asked other magicians where I could source some new bags for my banner stands and I was overwhelmed with replies. It ended up leading into a discussion of bags and carriers that can be used for lots of items. Many of the solutions are quite creative! Christopher Cool shared a link to a company called UndercoverNYC that produces custom covers and bags for audio equipment, but they can be used for anything since they build them exactly to your specifications. You can send them the dimensions and weight of the items and they’ll make a custom bag to fit them perfectly. These bags are a bit more expensive than other options, but you’ll end up with something specific to your needs. Have you ever Googled yourself? Of course you have. Everyone has! But did you know that there’s a way you automatically receive an email every time a website online mentions you? With Google Alerts you can set up a search phrase so every time someone online posts a specific piece of text, such as your name, Google will send you an email telling you what it said with a link to the website. I have mine setup so whenever someone posts the words “Leif David” it will send me an email. I also have a couple other alerts setup for similar search terms. As you can see there are two mentions of “Leif David” from a local newspaper. Neither of them are hyperlinks to my website so ordinarily I wouldn’t have noticed that they had been posted online. With the alert though I automatically get notified directly in my inbox. Google alerts are a great way to find out who’s talking about you online. Personally I’ve found stories in the media on me as well as festivals and events including me on their schedule of events. I also have a filter setup in my email so that alerts are diverted to my newsletter folder instead of my inbox to keep everything organized. In the “Create an alert about” search box enter in the words or phrase you want to get email notifications for. Then click Show Options to customize your notification and search settings. Did you setup a Google alert because of this article? Let me know in the comments below. As always, don’t forget to share this article with your other magic friends. Stay healthy. Pack a lunch. I did something I’m not proud of this summer. Whenever I had a day filled with shows all over town I would quickly stop for a quick bite to eat at a fast food restaurant. Large coke, fries, and a chicken burger. So delicious, but I paid the price for it. I ended up getting sick twice during my heaviest performance schedule ever. Performing that many shows everyday plus lots of travel draining and I wasn’t feeding myself properly. I ended up adjusting by packing lunches for my day trips rather than eating out. I bought one of those small foil-lined lunch bags. Instead of using an ice pack I would include a frozen bottle of water that kept everything cold all day long. Some of the food items I packed were sandwiches, cut up veggies, crackers, yogurt, trail-mix, hard boiled eggs, fruit, extra water and pop. If I had more self-control it would probably be better if I didn’t include the pop, but having that caffeine to keep me going for the third show in a day helped. It was also great to have freezing cold water waiting for me in the car after a show on a hot summer day. Summer’s in the Okanagan can get VERY hot, and after performing in a venue without air conditioning, or doing an outdoor show, or even just having to repack the car when it’s really hot out, its great to have cold water to cool off immediately. Previously if I didn’t have any extra time between shows I would just have to skip a meal and I would be starving by the time I had some free time. Plus I was able to eat better quantities of food since I didn’t have to eat that entire value-combo just because it would go bad in the car between shows. Instead I snack and eat throughout the day in better quantities keeping me full without overeating and feeling gross. It sounds silly to make a post about something so mundane and ordinary as packing a lunch, but it really did make a difference for me. And judging by the waistlines I’ve seen at magic conventions… we all need a little reminder to eat healthier! If you’re looking for ideas for healthy lunches there’s an endless list on pinterest and other blogs. Performing for kids is always a unique experience, which can either be a really fun and rewarding or it can be a true test of your patience. Generally children’s shows have lots of audience participation so you’ll end up with all kinds of personality types on stage. Eventually you’ll end up with a kids on stage who just don’t want to behave properly. I’ve found that these children raise their hand to volunteer to be on stage, but once they’re on stage they really don’t want to help. Sometimes they don’t follow directions intentionally because they’re ‘acting out’ or because they’re nervous, scared, or shy. The child will say “I want to sit down” or they’ll sit down without saying anything. At this point I can select someone else to come up on stage to finish the routine. Or; The child will want to stay on stage and at that point they’ve basically agreed to behave properly on stage. In very rare cases the child will stay on stage but still act up. At that point the only thing you can do is cut the routine short if its something that’s modular, or get to the end as quick as possible so they can return to their seat. The wonderful thing about this line is that from the audiences point of view, you’re giving the child a choice to either help out or sit down. Whenever I’ve had to use this line I’ve received comments from parents on how well I handled the situation. I hope this tip helps you out next time you’ve got a difficult child volunteer on stage with you. If you’ve got any tips of your own, please leave them in the comments below. As always, don’t forget to ‘like’ and share this post with your other performer friends. On Facebook John Villarreal shared a great DIY Magic Practice Mirror. This practice mirror was constructed by buying three mirror tiles, and simply attaching them together with electrical tape. Tim suggested using book binders tape instead because it’s a bit more durable and will last longer. The mirror tiles themselves only cost about $6 for all three making it an easy and inexpensive project to improve the effectiveness of your rehearsal time. Nelson Lugo also made up a similar mirror, but he used mirror plexiglass instead. The plexiglass is very light and won’t break if it’s accidentally dropped. When I’m first learning a new move I will practice it in the mirror. However when it comes to actual rehearsal time I will use a camera instead. I’ve shared my tips on working with a camera in this article. If you make one please leave a comment below. Don’t forget to ‘like’ and share this post with your magic friends. I’m working on a call to action on my email newsletter and was wondering about your thoughts regarding a ‘qualifier’ Ex: “Email today to save 948% off you next show!” vs.”Email today with the code ‘savetoomuch’ to save 948% off your next show!” I’m split on the merits of this, would love to hear your thoughts! Well, the difference between the two is that with the second option you have the option of tracking the results from the offer. Tracking codes are helpful if you’re looking to see where your marketing results are coming from: For example, on your facebook you could give people a coupon of ‘FBfriendsSave’ and in your newsleter it would be ‘Save2Much” and so you could see that you got 0 bookings through FB, and 2 from your newsletter, that you could focus your efforts on your newsletter marketing. You’ll need to make sure that your offer is strong enough that people will use it, and remember to give you the correct ‘tracking code’. Simply offering someone 5% off or something probably isn’t going to be enough. They will or won’t book regardless of the offer. Whereas, if you offer someone 50% off– they’re much more likely to book (even when they weren’t going to before) and they will also give you the tracking code. I’m not saying you should offer 50% off, it’s just an example. In my own business, I seldom offer discounts. I feel my price is already as affordable and fair as possible for the client and myself. Instead I will make offers that include free bonuses, such as close-up magic, balloon animals, goodie bags, or DVD’s. That way I can still offer my loyal customers an offer without the need to reduce my fee. I’m not looking to build my customer funnel with people who are looking for the cheapest priced entertainment. Instead I want customers that are looking for the best entertainment that fits into their entertainment budget. I find that these type of customers lead to better events, better audiences, better shows, better word of mouth, and in the end a better business and life for myself. Every year around tax season I always swear that I’ll be more organized next year. Then next year rolls around and I’m still matching up a box full of receipts with my credit card statements. In every other aspect of my business I have systems in place to keep me ultra organized, except when it comes to my taxes. I’ve always wished that there was a better way to organize my taxes throughout the year. Ideally I’d like to ditch the paper receipts completely and go to an entirely digital system. I did some research and I found a few products and services that fill this market but none of them met all of my criteria. There were several solutions that were close but they didn’t have support for Canadian users. This week I’ve got a guest post from David Ranalli. 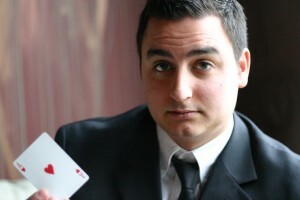 David is a professional magician based out of Indianapolis. In the post below he shares some great tips on how to implement QR codes into your marketing mix. What is a QR Code? A QR (Quick Response) code looks like the image to the right. People can use an app on their phone to scan the code and it will either show them some information, or direct them to a website page. “QR Codes are a great way to get fans or prospective clients to engage and go to a video, coupon, or other special offer. However, QR codes are often used very poorly, even by large companies with huge marketing teams. I’ve scanned a code and been sent to a 404 page, or on a hunt to find whatever the original code was meant to provide to me. If you are going to try using a QR code, it is important to do some research and look at proven strategies. When you do take the plunge to trying one out as I did recently, you run into a problem; you may want to change the place your original QR code led to. The CASL is the Canadian Anti-Spam law, which is basically the equivalent of the CAN-SPAM act in America. Making sure your email isn’t marked as spam can be a tricky problem to solve. The best solution in my opinion is the most obvious but people don’t do it because it requires so much more work. If you don’t want your email to be interpreted as spam then you’ll need to make sure that it is targeted. That means that you’re sending an email to someone that will find it helpful rather than thinking it’s a shameless sales letter. You can do that by writing in the name of the person you’re sending it to at the start of the email (ex: Good morning John), the company, and other specific information that makes that particular email unique. Here’s a little trick I’ve used in the past. Your first email can just be an email asking for information about the correct person to contact. Then once they reply you can send off your more sales information to the right person. The downside to this technique is that you have to wait for them to reply. But if you write your email correctly and send it to the right person you should get a reply most of the time. The upside to this technique though is that you know that your information is going to the correct person. Plus you’ll also begin to build a relationship with that person in a much more meaningful way than if you had just directly sent your promotional packet. Building a relationship this way makes it easier for you to contact them in the future with new information because you already have an existing relationship. Unless you’re doing huge amounts of email you don’t really need to worry about CASL. Instead you’ll want to send small amounts of highly targeted emails. If you need to use some sort of mail-merge or bulk email sender, that should be a red flag that your emails aren’t targeted enough. Just don’t spam people and you should be fine.